I was in the mood for some baked goodness this weekend and the best baked goods always come from Morning Glory Farm. So I took out my favorite cookbook for some Vineyard scrumptiousness. 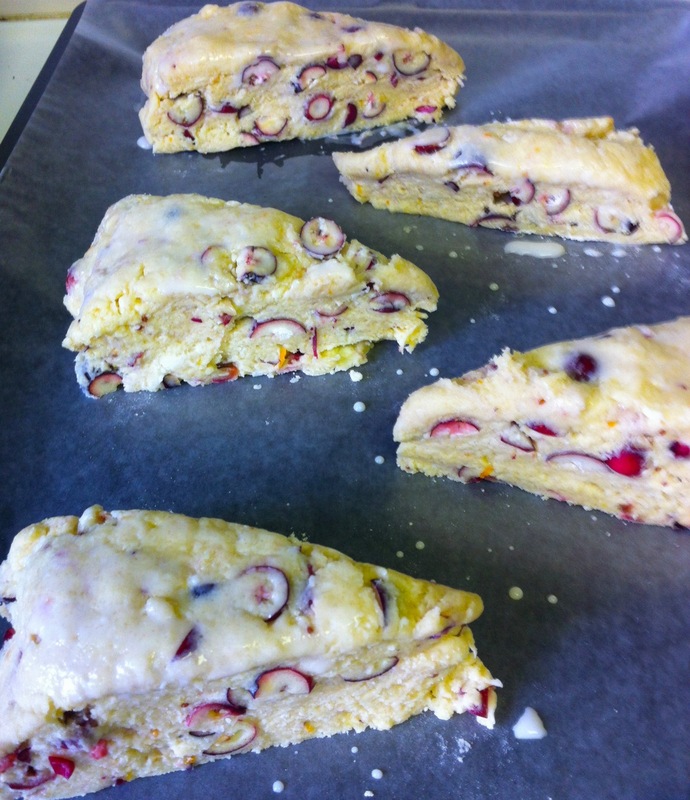 Scones are kind of intimidating, you’ve got to get the butter nice and cold and work the rock hard butter into the dough with out over work the dough… My mom has a great way for cutting the butter into scones which makes the whole process a breeze! 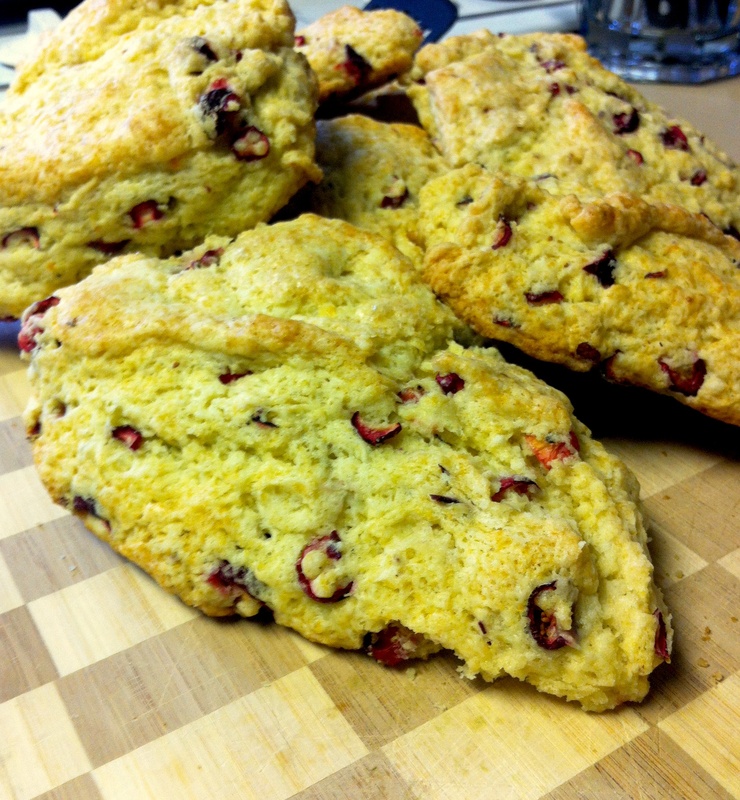 The fresh cranberries and orange zest give the scones a wonderful tart flavor and are a perfect fall treat. Enjoy! Preheat oven to 350 degrees. Line two regular sized cookie sheets with parchment paper. In a medium mixing bowl, combine flour, sugar, salt, and baking powder. 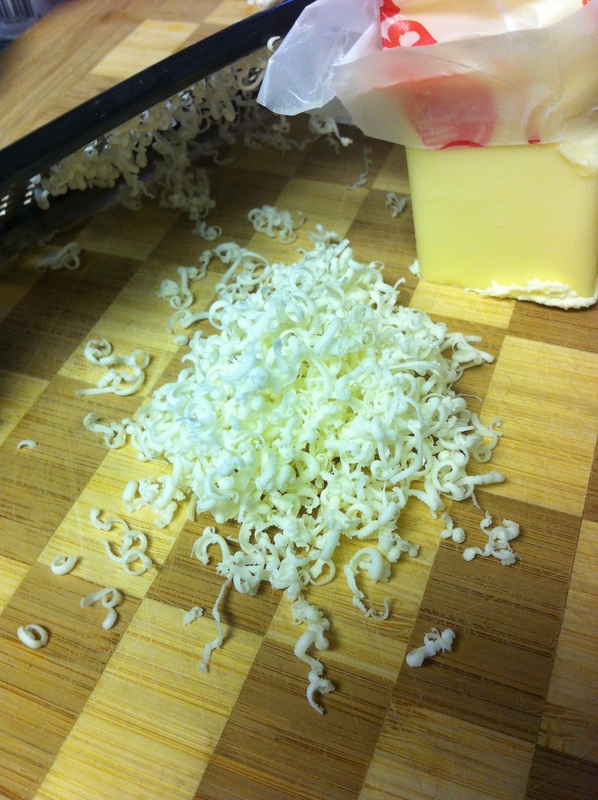 Now for my moms trick… using a grater/zester or box grater, grate 1 1/2 sticks of butter into flour, cut in cold butter until flour mixture seems mealy and resembles small peas. 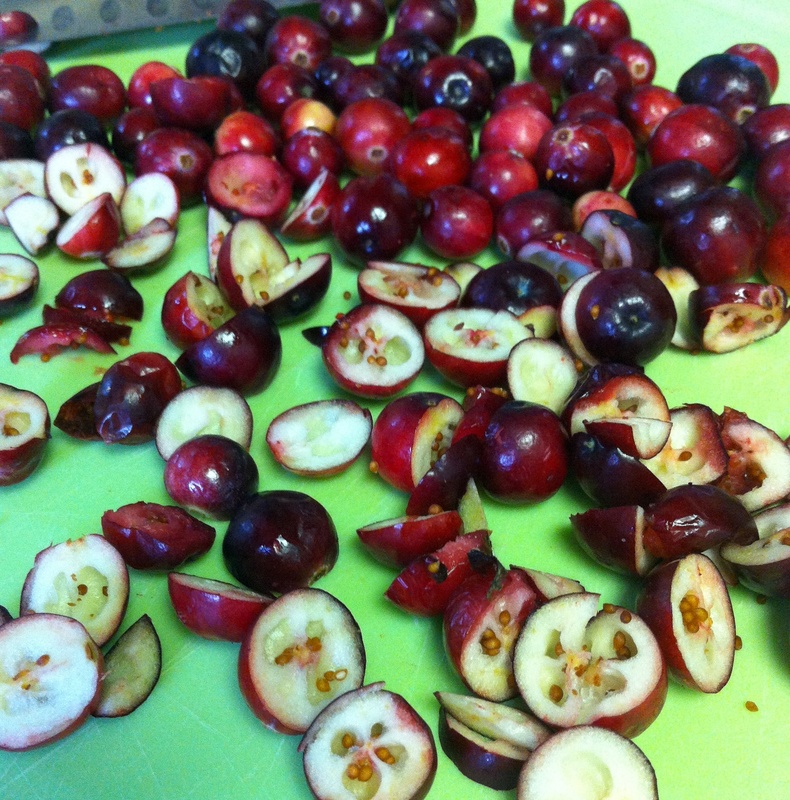 Once butter is well incorporated stir in fresh chopped cranberries and orange zest. In a separate small bowl, stir heavy cream, orange juice and eggs until well blended. Using a pastry cutter or large fork mix the egg, cream and juice mixutre into the dry ingredients just until a rough dough has formed. Flour the surface of a wooden cutting board and turn the dough out on it, gently shaping the dough into a ball and flattening slightly. 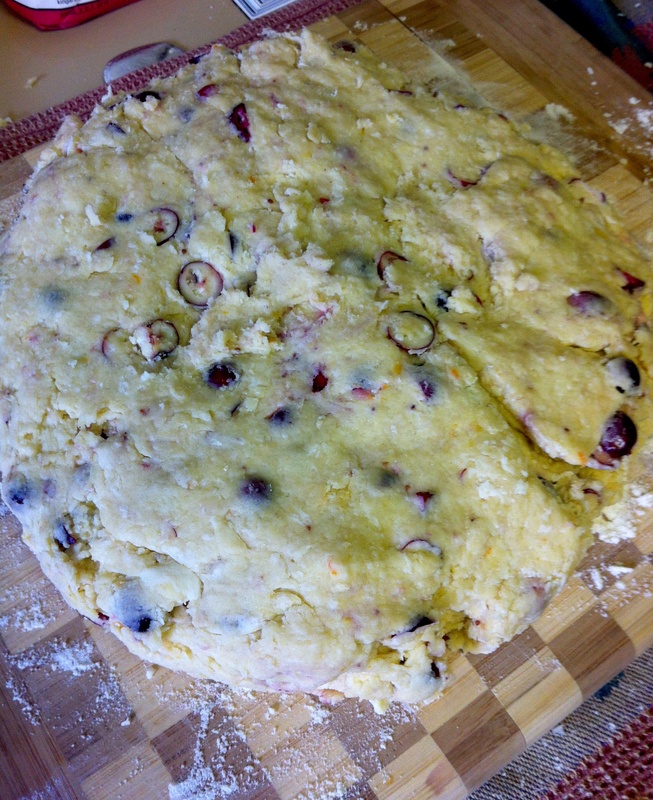 Using a dough cutter or knife, cut the dough into 10 equal triangles. Place triangles evenly spaced about 2 or more inches apart on the parchment paper on the prepared pans and flatten slightly. Using a pastry brush, brush lightly with milk and sprinkle with sugar. Bake for approximately 20 minutes or until lightly browned. I added an extra 1/4 cup of flour to the recipe since I live above 6,000 feet (they also required extra time in the oven at altitude, about 10min. Keep checking them to make sure they are golden brown and do not burn if you leave them in longer!) Enjoy with fresh jam, honey or as they are! Makes 10 very large scones. Recipe from Morning Glory Farm. 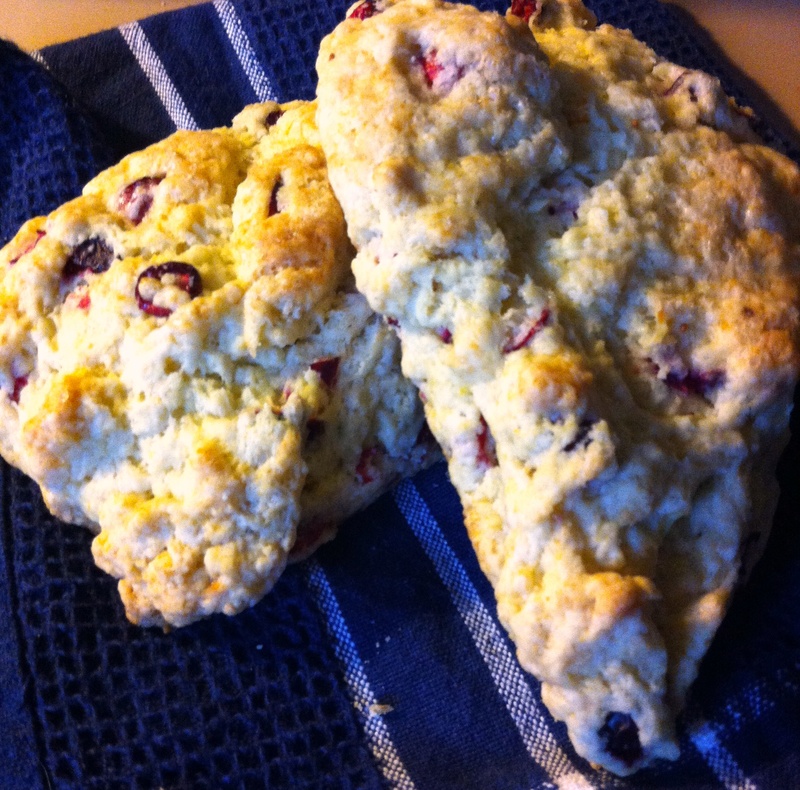 This entry was posted in Baked Goods, Breakfast and tagged Cranberries, Orange, Scones by skibootsinthekitchen. Bookmark the permalink.